One of the best resources for sweepstakes addicts! Spend less time looking and have more time to enter and win sweepstakes, giveaways and contests. 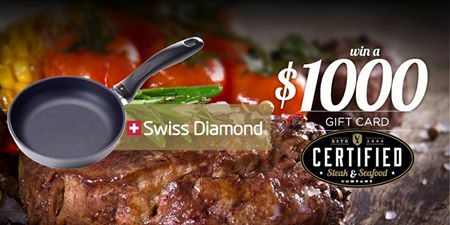 Swiss Diamond and CertifiedSteak.com have teamed up to offer fans a chance to enter once to win a $1,000 Certified Steak and Seafood Gift Card to start the New Year off right! This Sweepstakes ends on 01/13/17 and you can ENTER ONCE to win. Sweepstaking.net is your one stop shop for sweepstakes addicts to utilize in order to find and enter sweepstakes, contests, giveaways and promotions! I am not in any way endorsing any of the sweepstakes listed on my blog, nor can I guarantee the validity of any of the sweepstakes that appear in the listings on the website. If you have any specific questions regarding issues that you may have when trying to access or enter a sweepstakes like problems with the page loading, with logging in to their website or any other difficulties in entering their contest, you should report those problems directly to THAT website. I cannot do anything about the quality of any of the sweepstakes I list here, that is up to the administrator of the actual sweeps page. All of the images on my blog or website which are posted with any promotion or sweeping info are credited to the original page where the promo is listed. I strive to be your #1 sweepstakes site. Thank you for visiting and Happy Sweepstaking! ©2017 Sweepstaking.net. Powered by Blogger. 2017 is FINALLY HERE! Happy New Year!